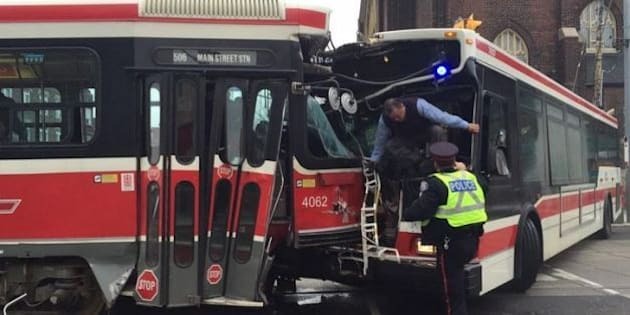 Four people received minor injuries after a streetcar and a bus collided head-on at Main Street and Danforth Avenue Saturday morning. Paramedics were called to the intersection around 10:15 a.m., and transported the four patients. One person was transported on a backboard, two were shaken up, and another patient complained of chest pains, according to paramedics. Streetcar route 506 Carlton is turning back at Coxwell Loop, according to the TTC. Shuttle buses are operating instead. TTC buses 23 Dawes, 20 Cliffside, 113 Danforth are also diverting via Victoria Park Station due to the collision.